The owner of a Grade II listed building widely damaged by vandals says he will go ahead with renovating the property. 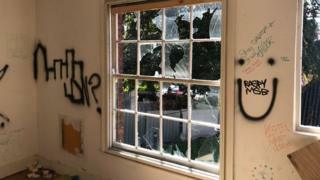 Graffiti was sprayed, windows smashed and lead piping damaged at the property in All Saints Green, Norwich, at the weekend, as the Evening News reported. Ben James, from Estateducation, said he was "naturally disappointed" by the vandalism, which could cost up to £30,000 to fix. The building had been derelict before the company bought it six months ago. Planning permission was granted in March for the property to be turned into nine new flats. Mr James said: "Whilst it seems the insurance will not pay out for such a circumstance, we will endeavour to move forward and deliver modern upmarket homes in a historical part of Norwich." Steve Sizer, from Devise Construction, which is renovating the building, said: "People managed to get in over the weekend and absolutely wreck the place. "We were very close to start working on it and whoever broke in had a massive party. "The damage they have done to historic parts of the building you just can't put right." Norfolk Police said the incident was reported at 10:36 BST on Tuesday. Officers are looking into whether it could be linked to other incidents at a construction site.